It is well known that terrorists commonly used wire-controlled IED (improvised explosive device). Commonly, they use SPP-2 — standard blasting cable, common telephone wire obtained from the main telephone lines and 0.5-1 sq.mm gauge coils wire from transformer windings of household appliances and industrial electronic equipment. As a rule IED command line length is from 50m in urban condition and up to 350m in the country. Conventional searching devices such as R-299, R-299g, PCI-400 and Gemini-3 used for these purposes frequently produce negative results, especially when the line is rather short. STT GROUP engineers, on their own initiative, designed NR-12C — the Portable Command Line Detector for shot wire-lines investigation. NR-12C was made for engineer forces, law enforcement squads and security teams an inteded for the field application, its main task is to reveal IED command line, determine is location and trace its route. NR-12C can detect IED command lines with a length of 20m and more routed underground at a depth of 30cm max at the distance of 4m from its terminals. Target detection is defined by specific beep-signal in the headphones. Target detection accuracy — not worse than +/-10cm. Power supply — 6xAA cell (2.5Ah). Continuous operation time (under normal environmental condition) — not less than 10h. Startup time — not more than 10min. Search rate equals to 3-5km/h. System weight in operational mode — not more than 3.3kg. Relative humidity (under +25°C) — up to 100%. IED short command lines detection (starting from 20m). 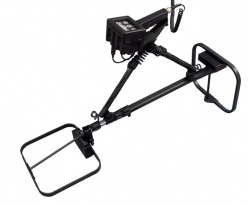 NR-12C can be easily fitted to operator's height, surface relief and the height of vegetation. Two operation modes (detection of ied control lines and their layout). LED indication: signal level in wire-line searching mode and direction of deflection from the detected line trace. Power-source-state LED indication together with continuous voltage control. Spaced generator and receiver modules operation facility.